Living Cities offers new solutions for creating sustainable communities in Sweden and internationally. By working with the social aspects of urban development we want to create more inclusive urban spaces and alleviate differences in living conditions. Our approach is based on the principles of dialogue, co-operation and transparency, focusing on the interaction between the physical and social urban environment. 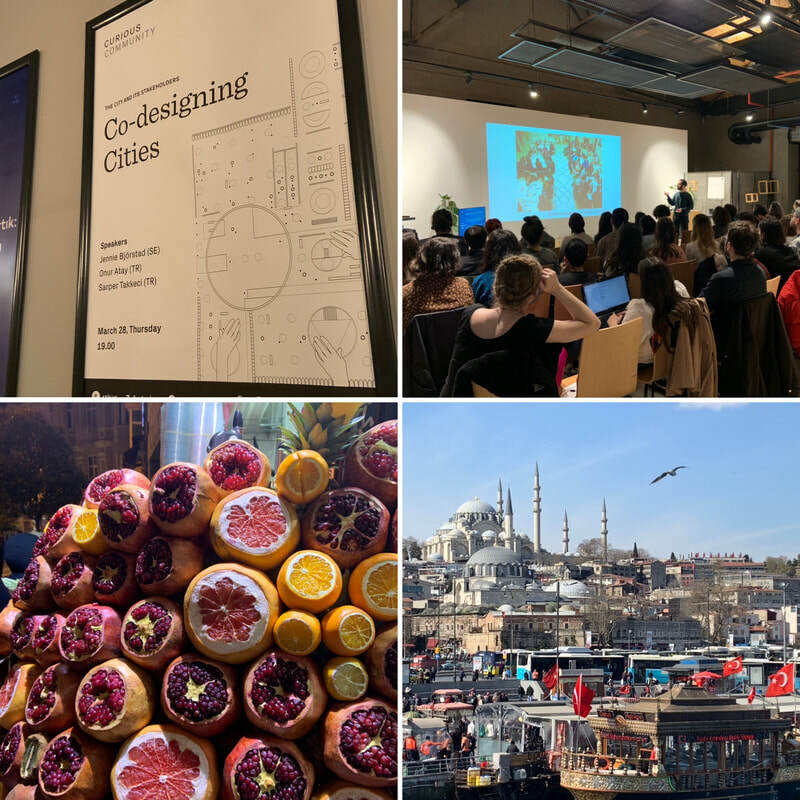 Living Cities participated in a Curious Community event on the theme Co-designing Cities; social aspects of urban development and how to create more inclusive urban spaces. Curious Community is organized by the transdisciplinary innovation platform ATÖLYE and 3dots in partnership with the Swedish Institute. Pedalista speaks at the National Forum on Gender Equality! Living Cities was invited to present our initiative and methods for inclusive biking at the Swedish national Forum on Gender Equality in Luleå. Living Cities core team expanded! Yesterday on #Worldbikeday, we were at the opening of Blåktlintsparken in Hallunda where we gave a hand to those who wanted to repair their bikes and feel the breeze on their faces again. The idea was to show how to identify a problem and fix it yourself. That’s why we had a dream team of professionals and volunteers. Thank you all that showed up! More events are coming soon. Stay tuned! How can the paths leading towards work experience be shortened for youth in Botkyrka municipality? In collaboration with the social startup The Good Talents, Living Cities explores young persons’ desires, needs and challenges in getting employed. We involve youth – both immigrants and people born in Sweden – the municipality and potential employers to gain insights which can be converted in to practical action! Just concluded an Urban Leadership Forum in Nakuru with 65 decision-makers from across Kenya. We ended up with a 12 point resolution on how leadership can help the country transition into a sustainable urban future. "Users of the Urban Systems are the inhabitants, they should be put in the center of the planning process." Helena Ohlsson, SKL International. Last week we were at Sida's HQ to moderate the SymbioCity Seminar "How can cities achieve the Sustainable Development Goals?". With a focus on issues of gender equity, poverty reduction and environmental resilience the participants discussed the key challenges cities face in moving towards the fulfillment of SDGs. Bubbly after work at Tyresö! On Friday, September 14, Tyresö kommun invites all residents of Tyresö to a sparkly and bubbly after work. WHAT? We are celebrating the summer final of “Torg på prov”. The street band Bicycle Beat will play a happy mix of hip hop, afro-beat, jazz and balcan music. Meet municipal employees and have a chat about the current expansion as well as the development of the center. WHERE? “Torg på prov” and its temporary benches are located by the bus terminal, between Pressbyrån and Tandvårsteamet at the entrance of the centre of Tyresö. Living Cities and the Swedish University of Agricultural Sciences are working together on an exciting project that will develop tools for participation and co-creation in the planning, design and management of urban green areas. Urban green spaces are important for health and wellbeing, and all people have a right to feel welcome, safe and to use these spaces without fear, anxiety or stress. This project will develop solutions for increased and equal accessibility to green spaces in collaboration with groups who currently experience barriers to access. The 4-year project is funded by Vinnova within the program "Innovations for a Sustainable Society 2018"
What does mobility, climate and social sustainability have in common? ​Living Cities and the communication agency Big Words are supporting Botkyrka municipality with knowledge and innovative strategies to make walking, biking and public transport more attractive and accessible for the sake of the climate, the city and different groups of citizens! New ADB assignment on Slum Upgrading in Indonesia! ADB’s South East Asia Urban Development and Water Division (SEUW) is formulating a loan targeting slum alleviation in Indonesia. Living Cities provides conceptual support for the design of the project by providing inputs to: best practices compilation and comparison; concept design and development; and review of outputs of financed consultants. A series of bike training workshops begin! Education of new biking trainers! Next week, women in Hallunda and Norsborg will start practicing the art of biking. The training is an initiative by Pedalista and Botkyrka municipality, in collaboration with Cykelfrämjandet and Botkyrkabyggen. Oh - if you want to participate as an assistant coach - give us a hint!